The French island of Martinique is a place of cultural fusion. It’s a mix of European architecture and 100 percent African-flavor traditions, which makes this destination quite unique. You will find plenty of activities to take part in while visiting this island: relaxing on the beautiful southern beaches, exploring mountains and volcanoes or admiring the colonial architecture of the populated Fort de France. Then you can delight yourself with delicious French-influenced cuisine, accompanied by Bordeaux wine and maybe later a glass of Caribbean rum to finish a perfect day. Martinique’s capital, Fort de France, is a vibrant and lively place with beautiful colonial architecture, boutique shops and amazing Creole markets. At night some areas seemed a little shady to me, but it’s definitely worth a visit. 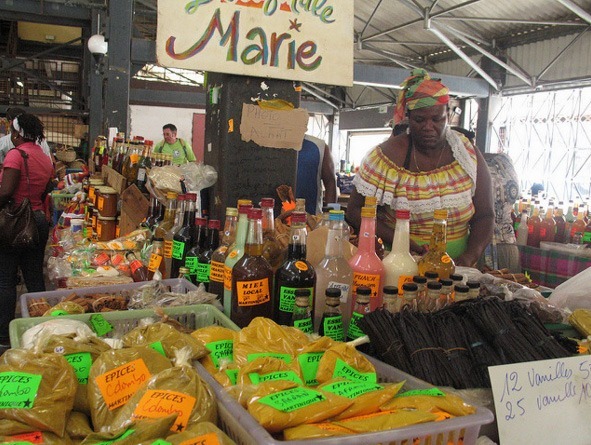 Fort de France market. photo by Gael Chardon. flickr. Formerly known as the “Paris of the Caribbean”, the city was seriously damaged in 1902 by the eruption of Mount Pelée, which killed more than 20,000 residents. Built on the ruins of the old St. Pierre, the new city offers dramatic views of Mount Pelée. The Volcano museum carefully describes those events and the current volcanic activity in the region. The more adventurous can complete the hike to Mount Pelée, an impressive volcano with stunning views of the northern part of the island. The trek can be completed in the same day and offers a variety of different sceneries, flora and fauna. The small village of Sainte Anne is the perfect destination for those who want to spend a few days on an idyllic beach without spending a fortune. 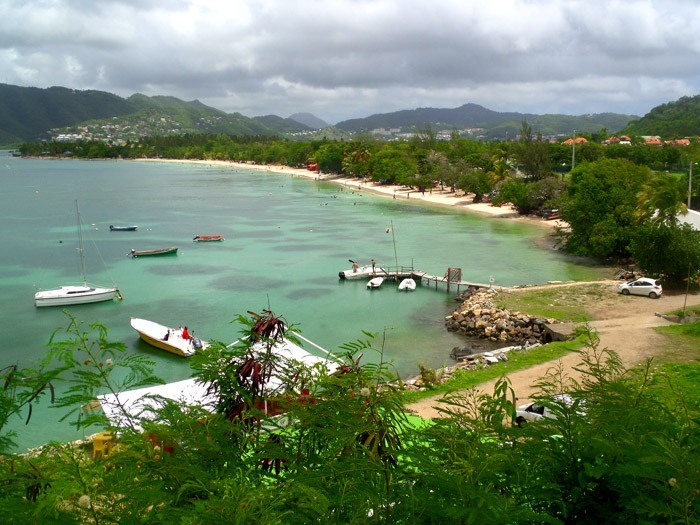 Sainte Anne’s camping, located just behind the beach, offers options for all budgets. If you stick with camping, taking a few vans or even hitchhiking sometimes, it is possible to travel around the island for about $18 a day, including some occasional luxuries, like a bottle of red wine. Sainte Anne’s camping: 12 euros to pitch your own tent for up to 3 people. The price per ride is 80 euros, regardless of the distance. You can book it online her, on the Express des IIes website. Supermarkets offer the same prices as in Europe. The difference with the neighboring islands is that here you can find good French cheese and wine. Keep in mind that the hurricane season runs from July to November, although you can travel any time. You can pretty much get around the whole island by hitchhiking. The local people are super friendly and will always help you. The marina of Le Marin is an excellent place to look for a sailing boat lift. It’s one of the busiest ports in the area so it’s always full of boats. Within the marina is a bulletin board where you can leave your own ad. Do you have any question about Backpacking in Martinique? Leave a comment! This article is very helpful to plan your trip. I m french and I work as a tour guide in Martinique. See my profile on Viator. If you are staying a few days I highly recommend you to hike the mount pelee, to visit saint pierre, to visit at least one active rhum distillery, to practice scuba diving (Le rocher du diamant or la perle), to discover Le canal des esclaves, and to visit the habitation clement. But you ve got so many things to do and discover.